For a second year, Le Jardin Academy is proud to offer the Don Dymond Scholarship to one of the members of our junior class. This scholarship was established by the Dymond family to honor the memory of Mr. Don Dymond. Don was the founder of Kalapawai Market and its sister Cafe in Kailua town as well as a generous supporter, parent, and Trustee of Le Jardin Academy. Don employed many students at Kalapawai. He felt it was important for students to understand the concept of hard work and have the education to know how to work in a smart fashion. In honor of Don, his work ethic, and his commitment to mentor young people in the workplace, this $1,000 award is to acknowledge a Le Jardin student's actual good work, both in school and in the workplace. Information regarding the application for this scholarship will be sent out to junior parents and students in the following week. Tenth Grade Diploma Programme Night was held this past Tuesday evening in the Wang Auditorium. This informational event was a time for parents and students to ask questions to different teachers and learn more about DP courses at LJA. Thank you to all parents, students, and faculty who came out on Tuesday night for our DP Information Night. While some of the presentations and discussions were, of course, around the technical aspects of the DP, I was delighted that conversations in which I was involved also focused on big questions like: "how will this course change my world view?" or "Which courses would be best to expose me to other cultures". I look forward to working with the Sophomore class and families as we transition into the DP. I also wanted to let parents know that we will have a High School wide guest speaker, Pam Chambers, on February 7th who will give a talk covering presentation and academic skills. Pam is known to many people locally as an incredibly engaging and wise speaker so I am sure it will be a worthwhile experience. This event will begin at 2:00pm in the Wang Auditorium. It's that time of year again when we are completing our human anatomy & physiology unit in DP2 Biology. 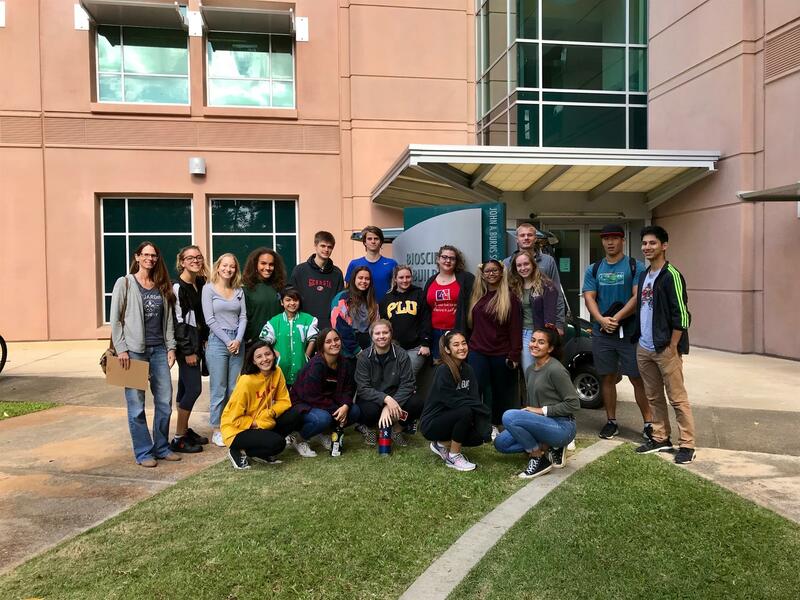 On Monday, January 28th, the DP 2 Biology students got the opportunity to visit the human anatomy lab at the UH Medical School in Kakaako. Everyone had an interesting and very educational experience! On Sunday January 27th, Tenth grader Brin Jaffe took home a first-place medal at the Oahu Band Directors Association competition. This solo ensemble competition took place at the University of Hawaii's music department and was judged by band directors around Oahu as well as professional musicians from the Hawaii Symphony Orchestra. Brin earned a first-place medal with a perfect score performing her solo, Carmen: Fantaisie Brillante by Francois Borne. We are proud of you, Brin! Sign up HERE for Yoga Session 2 and enjoy the amazing benefits of this practice. Mark your Calendars...The Sophomore Lock In is around the corner! Thursday, February 21st from 5pm until Friday, February 22nd at 1:30pm. Paperwork and payment are due Friday, February 8th to Mrs. Omori or Mrs. Broussard. Jamba Juice smoothies will be available this Friday, February 1st during Middle and High School Lunch. $5.00 per juice. All proceeds benefit the Class of 2019 Project Grad. Invite friends, family, and prospective students to the LJA Open House on Saturday, February 2nd from 10 a.m. - noon for all grade levels. Come and see what it is like to be a part of our community! Click HERE for more information. Students will choose a monologue from a list of the works of Shakespeare and perform it from memory.The Competition will be here at LJA next Wednesday, February 6th from 2:30-3:30pm in the Wang Auditorium. The winner of the school competition proceeds to the state competition, which will be held on Saturday, March 2, 2019 at Luke Auditorium in the Punahou School's Wo Center. This will be the fourth year that Le Jardin has participated. The PFA-hosted California Pizza Kitchen (CPK) Day is coming up on February 13th at the Kailua Town location. You can have 20% of your check donated to LJA's PFA.